BlackRadioIsBack.com Will Be Representing At The Susan G. Komen Global Race for the Cure in Washington, DC - PLEASE Donate! | BlackRadioIsBack.com - Official Blog of the Syndicated FuseBox Radio Broadcast! BlackRadioIsBack.com Will Be Representing At The Susan G. Komen Global Race for the Cure in Washington, DC - PLEASE Donate! This year, I'm going to make my own individual impact on the fight to end breast cancer by participating in the Susan G. Komen Global Race for the Cure®. Tens of thousands of people will gather on the National Mall in Washington, DC on June 5, 2010 to take a stand and prove that individuals have the power to change the world. Without the cures, an estimated 25 million women around the world will be diagnosed with breast cancer – and 10 million could die over the next 25 years. That's why I'm joining the fight. I hope that you'll support me. I've set my personal goal of fundraising to at least $125. If you can, please help out with a donation, no matter the size or amount. 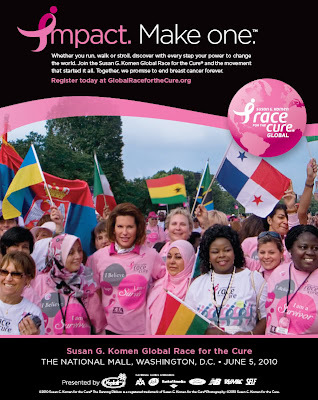 PLEASE help me reach my goal for the Susan G. Komen Global Race for the Cure! You can give online at either my team page http://bit.ly/FuseBoxRadioRaceForTheCure, GlobalRacefortheCure.org or click the banner above to make a direct donation. Personally, I've had numerous family members, friends and others who have been affected by Breast Cancer, so this is one of the causes that's very important to me. Up to 75 percent of the Komen Global Race’s net income stays in the Washington, D.C. metropolitan area to fund local screening, treatment and education programs for the medically underserved. The remaining dollars support the Susan G. Komen for the Cure Global Promise Fund, a program which is dedicated to reaching underserved people in areas where breast cancer mortality rates are the highest. P.S. Ask your employer if they will double your donation through a matching gift program!